Union Pacific EMD SD70ACe 1988 "M-K-T"
In 2005, Union Pacific Railroad began painting several brand-new EMD SD70ACes in a series of "Heritage" paint schemes, paying homage to several of UP's major acquisitions since 1980. There was considerable railfan buzz about this new program, though some were disappointed that the units did not carry "authentic" paint schemes from the railroads – UP's designers came up with stylized paint schemes that utilized colors and elements from different eras on those railroads. 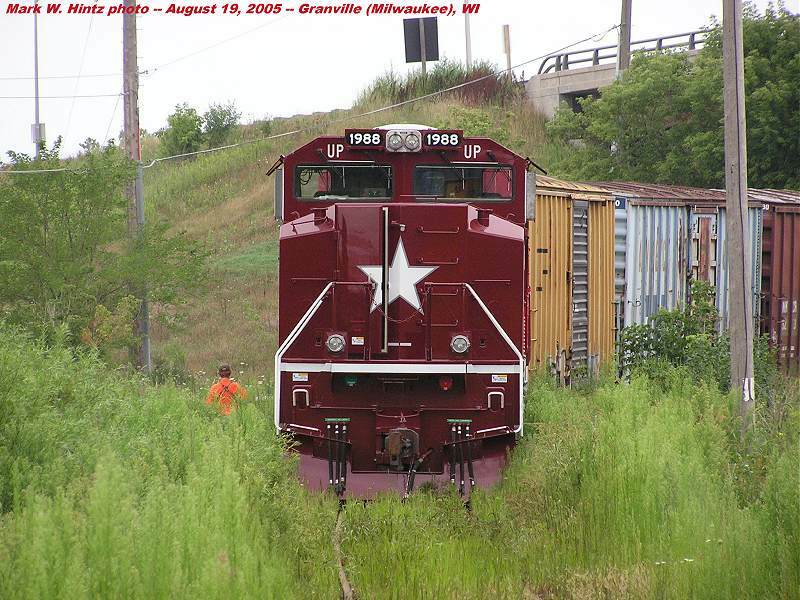 UP selected Wisconsin & Southern's Horicon paint shop to do the work. Horicon had painted several items for UP in the past, including the 2002 Olympic Train, and they have a reputation for high-quality, long-lasting work, so the choice was natural. While the first two units – "Missouri Pacific" 1982 and "Western Pacific" 1983 – left Horicon veiled in secrecy and wrapped in tarps for the unveiling in Omaha, the third unit (M-K-T 1988, shown here) was shipped untarped! Wisconsin & Southern's "HM" delivered the Heritage unit to the Union Pacific at Granville, in the northwest corner of Milwaukee, Wisconsin. Click here to start viewing the album, or click a thumbnail below to view the full-size picture. F11 will toggle a full-screen view in most browsers.